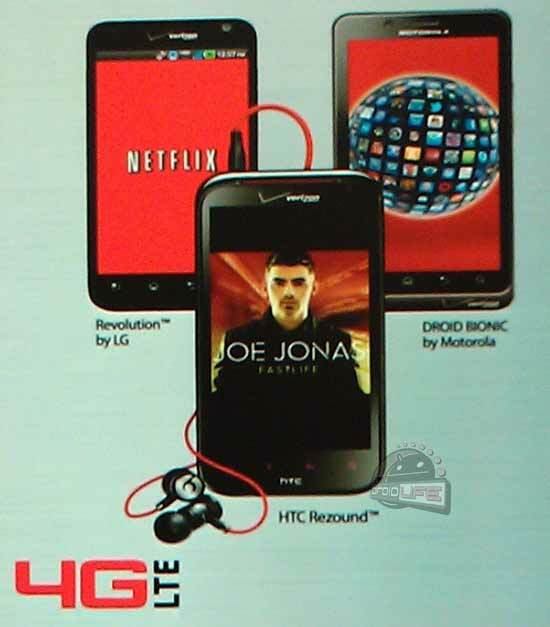 We already say Upcoming Verizon branded HTC Rezound for a couple of times. But now we have something ‘leaked’ from Verizon itself. Ads just went up in Verizon stores showing off the yet to be announced HTC Rezound along with other 4G LTE devices on Verizon's network. Also, for the first time, we're seeing the phone with a pair of Beats by Dr. Dre earphones in tow. And as far we know about the specs are it will have a 4.3-inch 1280 x 720 resolution S-LCD. It has a 1.5GHz dual-core processor and Android 2.3 Gingerbread. One can also expect to find the latest Sense 3.5 on board. We'll find out more about it on HTC's event on Thursday.